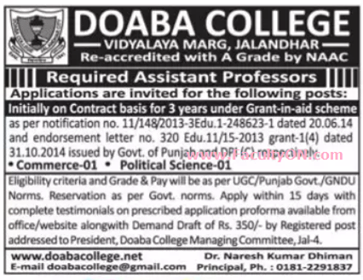 Doaba College, Jalandhar has advertised in TRIBUNE newspaper for the recruitment of Assistant Professor jobs vacancies. Interested and eligible job aspirants are requested to apply with in 15 days. Check out further more details below. About College: Doaba College, Jalandhar is a multifaculty postgraduate co-educational institution of Northern India which serves the Doaba region. The college has been accredited by the National Assessment and Accreditation Council, an autonomous body of UGC. Doaba College, Jalandhar was established on January 1, 1941 by Sh. Bindraban Sondhi, Rai Bahadur Badri Dass, Sh. Jagan Nath Mittal and Acharaya Lajja Vati.